The International Monetary Fund calls this a “delicate moment” for the global economy as many countries are in the midst of a slowdown. Resolving President Donald Trump’s trade war and Brexit could go a long way toward preventing a deeper slowdown, the IMF said. In 2017, Trump’s first year in office, 75 per cent of the world economy experienced an upswing, a moment of synchronized prosperity that resulted in one of the best years in global growth since the world was coming out of the Great Recession. This year, the IMF expects 70 per cent of the global economy to experience a slowdown. Lagarde said growth has been slowing largely because of Trump’s trade war and financial tightening last year. But she went on to say that the U.S. Federal Reserve has reversed course in a way that will “benefit” the world economy. The Fed no longer plans any interest rate increases this year, and it is ending its asset reduction, which Trump and Wall Street wanted. That leaves Trump’s tariffs and Brexit as the major factors weighing on the world economy, the IMF said. 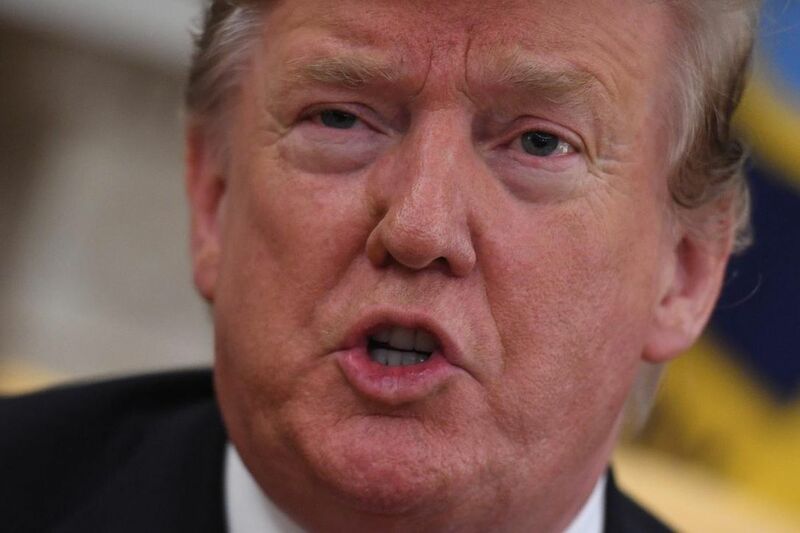 In new research released Wednesday, the IMF found that focusing on bilateral trade deficits, as Trump has done with China, is useless because erecting trade barriers against one country, such as China, typically results in the United States importing more from other nations. It is also a drag on global growth as businesses have to figure out new supply chains, and countries that are not as adept at producing products have to beef up production. The largest driver of the U.S. trade deficit from 1995 to 2015 was macroeconomic factors such as the fact that the United States was spending more than it was producing, the IMF found. The IMF predicts the U.S. trade deficit will widen even further because of “recent fiscal stimulus” from Trump’s tax cuts and the uptick in government spending. Last year was the largest U.S. trade deficit for goods in the nation’s history. Trump has repeatedly said he is using tariffs as a negotiating tool to get China to agree to stop stealing U.S. intellectual property and stop subsidizing so many industries. Top Chinese officials are in the United States this week for further trade talks, although it’s unclear if the two countries will be able to come to an agreement. There are signs that trade is sharply weighing on business sentiment. About 85 per cent of chief financial officers (CFOs) said they expect a U.S. downturn by the end of 2020, according to a quarterly survey of more than 150 CFOs by consulting firm Deloitte. “Those expecting a downturn were most likely to cite U.S. trade policy, business and credit cycles, and the impacts of slowing growth in China and Europe on the U.S. economy,” Deloitte said in its report released Wednesday. Trump has put hefty tariffs on nearly 15 per cent of all U.S. imports. Calls are growing for Trump to remove tariffs on steel and aluminum imports, which are causing costs to rise for many automakers and companies that use those metals to manufacture finished products in the United States. The Aluminum Association, which represents many companies that use aluminum, urged Trump to remove the metal tariffs Wednesday, a message that has been echoed by many Republicans in Congress. “Some kind of blanket approach to all imports of aluminum into the U.S. is bad. While well intended, this is detrimental to our industry because we rely on metal that comes, for instance, from Canada,” said Jean-Marc Germain, chief executive of Constellium, which manufactures various aluminum products. While global leaders are urging Trump and Chinese President Xi to reach a deal and for the removal of U.S. tariffs on steel and aluminum, most still say they are not expecting a recession. Only 15 per cent of the CFOs say a recession will hit by 2020. The IMF had a similar message this week. “To be clear, we do not see a recession in the near term. In fact, we expect some pickup in growth in the second half of 2019 and into 2020,” Lagarde said. That pickup is largely expected to come from more stimulus from the Chinese government to help that country rebound and resolution of Trump’s tariffs and Brexit. The IMF will release its latest growth projections for the U.S., Chinese and global economies next week.